Breaching The 'Wall': Is The White House Encroaching On DOJ Independence? Jeff Sessions is sworn is as attorney general on Feb. 9. There are questions now about the Justice Department's independence. The deputy attorney general strode onto the stage last week in a seventh-floor conference room at the Justice Department to announce criminal charges against two Chinese men who used the Internet to sell deadly synthetic drugs. "These cases reflect a new and disturbing facet of the opioid crisis in America," Rod Rosenstein, the second-in-command at Justice, told reporters who gathered for what was billed as a major development in the fentanyl epidemic that's afflicting the nation. DOJ veterans took note for a different reason: the fact that Kellyanne Conway, a counselor to President Trump, had ventured down Pennsylvania Avenue and past Justice Department security to hear the announcement in person. It's unusual for a White House adviser to appear at a news conference about an enforcement matter. And for Trump administration critics in Congress and out, it's yet another example of how the administration is refusing to respect the independence of the Justice Department. "Although we've had attorneys general who view their job as serving the president and as an extension of the White House, I do not believe that's the job of the attorney general," Sen. Dianne Feinstein, the top Democrat on the Senate Judiciary Committee, said in a hearing last week, one day after the fentanyl event. "The attorney general's master is the people and the law." Matthew Miller, who led the Justice Department's public affairs office during the tenure of President Barack Obama's long-serving attorney general, Eric Holder, said he could not recall a time when an Obama White House official traveled to the Justice Department to hear an enforcement announcement that was being livestreamed online. "It sends a message that these law enforcement activities are coordinated, directed by the White House," Miller said. "It's an appearance thing." 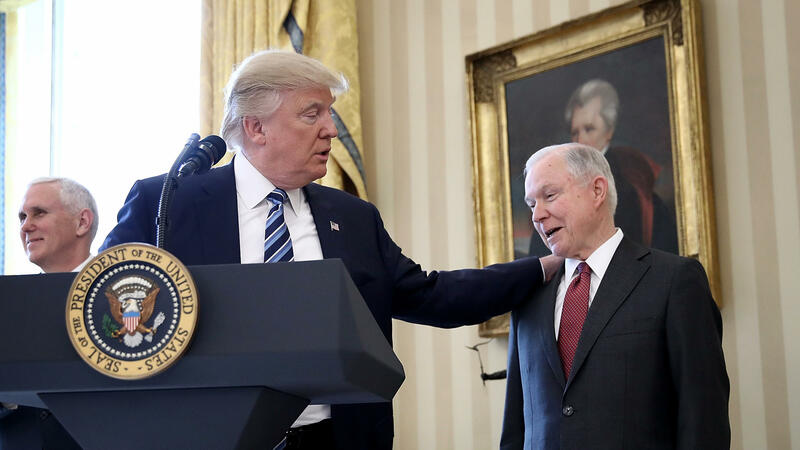 "The Department of Justice is an agency in the Executive Branch and the President, like presidents before and after, is free to communicate with Executive Branch appointees." "It is concerning that lawmakers would be so offended by an administration official, who is focused on the opioid crisis, being in the crowd at an open press event where opioid related prosecutions were publicly announced. Perhaps the better focus would be on how to address a drug crisis that saw 64,000 people overdose in 2016." But for Democrats on Capitol Hill, and veterans of Democratic administrations, it is the pattern of breaches that matters. They're asking why President Trump took the step of interviewing U.S. attorney candidates in Washington, D.C., and New York, venues that have legal jurisdiction to investigate his government and business activities. Preet Bharara, the former U.S. attorney in Manhattan who was fired by Trump earlier this year, told WNYC's Brian Lehrer Show on Wednesday that those meetings are cause for concern. "It's a terrible look for the president," Bharara said. "It doesn't inspire confidence in the president." Bharara's remarks follow an MSNBC interview with Holder earlier this week, when Holder asserted, "The Justice Department really is different from other Cabinet agencies," because of its law-enforcement investigations into public corruption, financial fraud and other sensitive subjects. "There has to be a wall," Holder said, between political operatives in the White House and investigators at Justice. And, he added: "History has shown us that when that wall is too low, that's when Justice departments get in trouble." Former Deputy Attorney General Sally Yates, who was fired by Trump in January after she refused to defend the administration's travel ban, has said she's been alarmed by the president's public berating of Sessions, whose recusal from the investigation into Russian election interference seemed to send Trump into a rage. "I believe that Attorney General Sessions respects the role of the Department of Justice, and it's really going to be up to him to protect the institution of the Department of Justice," Yates, who spent 27 years at the Justice Department as a career prosecutor, told All Things Considered in July. In his confirmation hearing this year, Sessions pledged to respect Justice Department traditions. But last week, in his first oversight hearing in front of the Senate Judiciary Committee, he cited the possibility the White House would invoke executive privilege in refusing to answer several questions. The attorney general said he could not discuss conversations he had before the president fired FBI Director James Comey and a separate instance, in which, the Washington Post reported, Trump asked Sessions to short-circuit the prosecution of former Arizona Sheriff Joe Arpaio. The Justice Department proceeded with the case, and Trump later pardoned Arpaio.